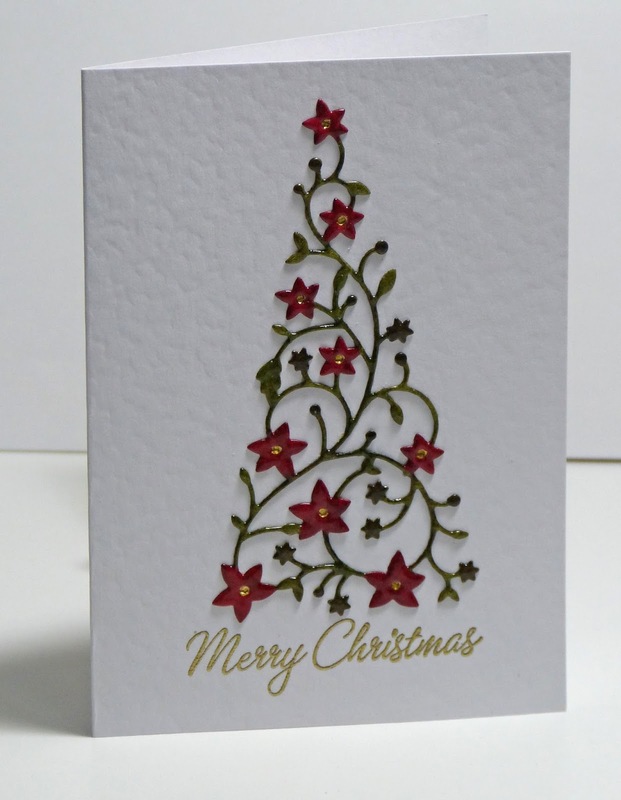 Cathy's Card Spot: Double embossed Christmas tree. Hi everyone, I've still got lots of Christmas to make! This one involved colouring in and double embossing with clear powder. I seem to use this Christmas tree every year but haven't used it with this technique, which has been around for ages. The tree is diecut from an empty tissue box as it's easier with something a bit more robust than normal cardstock, and I like recycling lol! I've coloured it with distress markers, festive berries, peeled paint and forest moss. I dried it well with my heatgun, then dabbed versamark ink over it. (I made sure my inkpad was reasonably juicy). Then sprinkled on clear embossing powder and heated it. I dabbed versamark on again and repeated the process to give more depth. I was worried that the markers might stain my versamark pad, but it was fine. Just dab on quickly. I used a toothpick to put some gold liquid pearls into the centres, and stamped the sentiment in versafine onyx black, then embossed with gold embossing powder. and to CAS Mix up Card Challenge where the theme is anything goes Cas. I've used stamping, diecutting and wet embossing. and to the anything goes challenge at Simon Says Stamp Wednesday. Memory Box Flowering Christmas Tree die; distress markers; versamark ink & clear embossing powder; Stampin Up Four the Holidays sentiment(retired); gold liquid pearls; Wow super fine metallic rich gold powder. Such a gorgeous tree and it looks fantastic colored and double embossed! So glossy! Love it! This is absolutely stunning! I have this die and rarely use it because it's so finicky, but I'm going to try your methods and see if I can't get good results like you did! I love the depth of shine on this beautiful tree! Well done! Simply stunning, I do love the glossy look, it looks like glass! Wow ! What an elegant and gorgeous tree ! Love your colouring and double embossing, it makes it so glossy ! Thanks so much for sharing and for playing along at Less is More ! OMG! Stunningly beautiful !! I think I have this punch, but you did real magic with it. Thank you for this wonderful inspiration, Cathy !! Oh my! Such delicacy and intricacy of your die Cathy. Perfect use of red and green and loving all that white space too. Thanks for playing along at Less is More this week. Gorgeous die cut colored and heat embossed tree Cathy. Your tree has such beautiful depth and shine. Love your dry embossed background too. TFS and joining us at CAS Mix Up. Happy Holidays. Wow, this is just stunning. The bright colors you used and the shine really comes through. Simply Stunning & Elegant! Love the technique you used here, gives such a natural crisp shine. Beautiful - love the technique you used for colouring it and then heat embossing. Gives it a wonderful substance and shine. Thanks so much for joining us at CAS Mix Up! What beautiful color and shine, Cathy! So festive! Thanks for sharing with us at CAS Mix Up!